playing jump rope, trying to jump in. and begin to keep the rhythm. Reminder- kids poetry contest is closing soon. Gloucester Lyceum & Sawyer Free Libraray childrens services Poetry Without Paper 2018 contest And send them to the Mayor’s office– she promises to read them! 2017 Call for Applications for Gloucester’s 5th POET LAUREATE is OPEN! Links for: 2017 Poet Laureate application (digital format) or 2017 Poet Laureate application (PDF format submit 5 copies). The City of Gloucester’s Committee for the Arts announces the release of the 2017 Call for Applications for the four year position of Gloucester Poet Laureate. 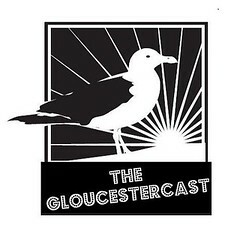 The position of Gloucester Poet Laureate is dedicated to building community through poetry and encouraging a love of poetry among people of all ages. The position was most recently held by the late Peter Todd, appointed in 2014. During Peter’s time as Poet Laureate, he generously shared his talents with his beloved City of Gloucester. Under City Ordinance, the process to select the Poet Laureate is administered by the Committee for the Arts and will involve a Selection Panel including representatives from the local literary community thanks to Eastern Point Lit House and The Gloucester Writers Center. A recommendation from the Selection Panel will be forwarded to the Committee for the Arts for review and then forwarded on to the Mayor for nomination, subject to confirmation by the City Council. 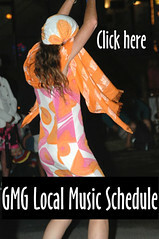 The Call for Applications is available for download at the Committee for the Arts page on the City website: http://gloucester-ma.gov/index.aspx?nid=102. Copies also are available at the Sawyer Free Library, the City of Gloucester Mayor’s Office, Eastern Point Lit House, the Gloucester Writer’s Center, and other locales. Applications must be submitted by 12 pm on Friday, June 9th , 2017. Contact Judith Hoglander, Committee for the Arts with any questions. National Poetry Month at Sawyer Free included this past Saturday’s super cute puppies and poetry program with Cape Ann Animal Aid . Poetry without Paper contest is open and National Poem in Pocket Day is April 27. Public Art: Blooming Poetry. What are you doing this month to celebrate? National Poetry month celebrates a milestone this year: 20 years. 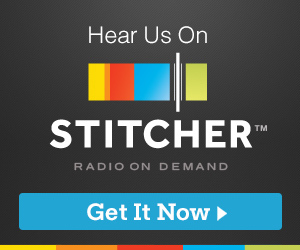 If you haven’t heard of this commemorative theme, a generation of children has grown up with this awareness from a parent, teacher, librarian or friend. Please let us know of local events and programs honoring poetry this April so we can collect them in one spot (write in comments below and add to James Eves calendar). 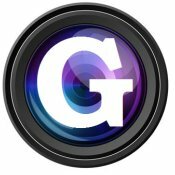 I am toying with ‘Terse Verse Thursdays’ as a possible theme for a series, because I’d love to share your poems on GMG. They don’t have to be strictly ‘terse verse’ where a two word rhyme response solves a question or statement. In the meantime, you have two weeks till National Poem in Your Pocket Day. Although the date skips around annually, this year it falls on April 21 as it did in 2002 the year it was established. PIYP Day (not sure this acronym will ever have legs) was inspired by the Favorite Poem Project founded by Robert Pinsky, former Poet Laureate of the United States in 1997. Write your own or carry a favorite to share with others throughout the day. What will you choose? 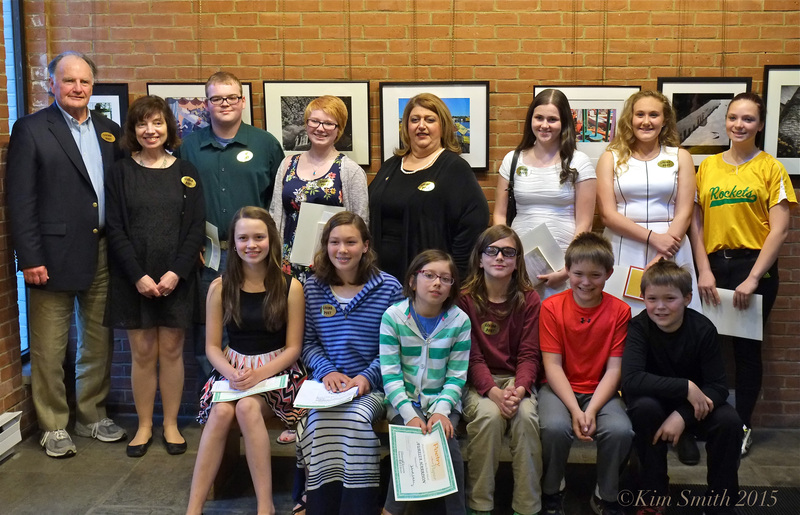 Gloucester children can submit their original poems to Gloucester Lyceum & Sawyer Free Public Library’s Poetry without Paper competition thanks to Christy Russo, John Ronan and volunteers who step up to serve on that jury panel. 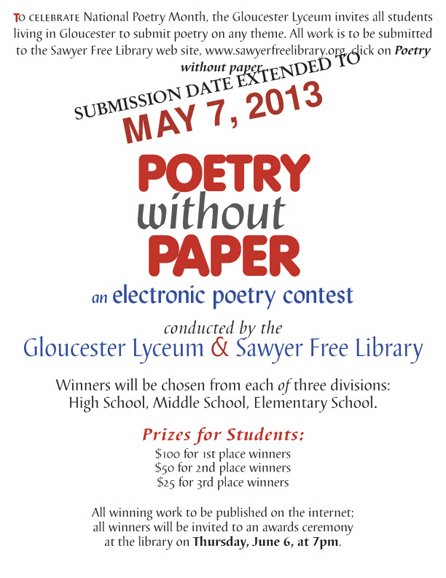 Gloucester students can send their original poems to the Office of the Mayor, 9 Dale Avenue, Gloucester, MA, any month. Mayor Theken promises to read them! Students should include their name, which Gloucester school, and their grade. Mention a teacher if they’ve helped. 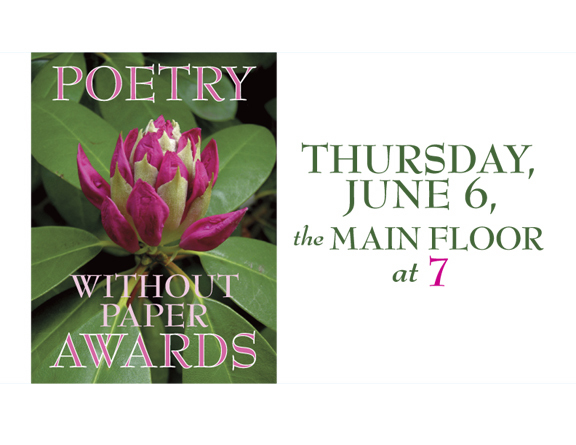 Congratulations to All the 2015 Poetry Without Paper Winners! 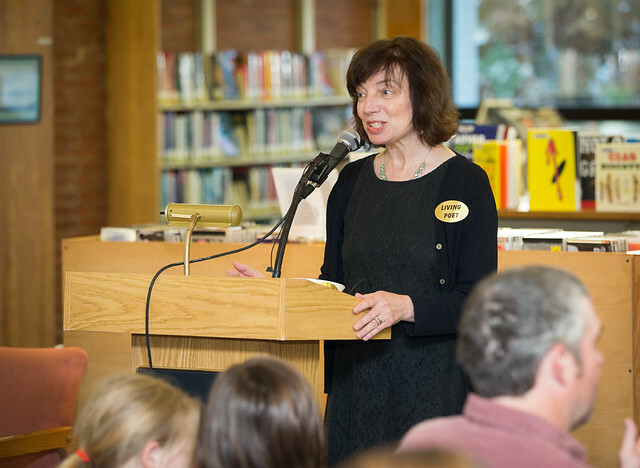 To celebrate April as National Poetry Month, the Gloucester Lyceum and Sawyer Free Library is proud to have participated in its twelfth annual Poetry Without Paper contest. 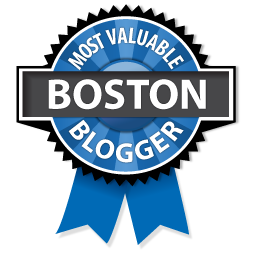 PRIZES: Each winner will receive a cash prize, a book of poetry, publication of the winning poem, an invitation to read the poem at the awards ceremony, and the chance to appear on the local TV program The Writer’s Block. 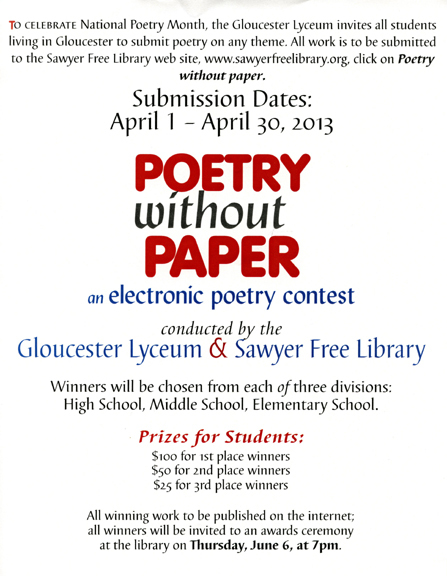 The Gloucester Lyceum and coordinator John Ronan have announced the 7th annual Poetry Without Paper contest for students living in Gloucester. All levels, from elementary, middle and high schools are eligible, whether the student attends school in Gloucester or not. The contest honors national poetry month and will have its official start April 13. Entries will be accepted at http://www.sawyerfreelibrary.org until May 25. Winners receive U.S. Savings Bonds, books, and an invitation to appear on Ronan’s television program, “The Writer’s Block.” All winning poems will be published online. 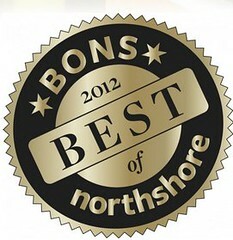 The presentation of awards will be made by Mayor Kirk on Thursday, June 11, 7 p.m., at the library. An evening of poetry, photography and song inspired by a collection of poems that record the voices of 19th century pioneer women as they and their families homesteaded the Okanogan Valley of Washington state, will be the subject of a Gloucester Lyceum/Sawyer Free Library program on Thursday, April 16, 7 p.m., at the library, 2 Dale Ave. The event, “Oh How Can I Keep On Singing:” Voices of Pioneer Women, celebrates National Poetry Month and is free and open to the public. The program will be performed by Kathleen Adams, Barbara Braver, Geraldine Herbert and Kristina Martin, and introduced by Jill Carter. Photographs of the Okanogan Valley taken by local photographer Susan Oleksiw during her visit to the area last summer will be on display in the Matz Gallery. Cape Ann Art Haven offers family studio time every Friday from 3:30 to 5:30 p.m. This is an opportunity to bond with your children through art. Cost is $10 for the first child, $5 for each additional child. CAAH also offers classes for third- through fifth-graders every Monday and Wednesday from 3:30 to 5 and 5:30 to 7 p.m. The class runs for one month and costs $60. CAAH also offers classes for sixth- through eighth-graders every Tuesday and Thursday from 4 to 5:30 p.m. and 6 to 7:30 p.m. The class runs for one month and costs $60. To sign up, call 978-283-3888 or visit info@capeannarthaven.com. Walk-ins are welcome. The Night Prowlers Car Club will hold its annual ’50s Saturday, April 18, at the Gloucester Fraternity Club, 27 Webster St. 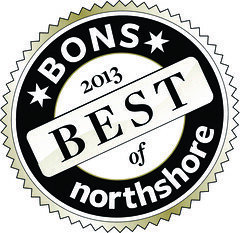 The dance will feature music by DJ Leo Francis, mystery guests, pizza at 9 p.m., door prizes and raffles. Doors open at 8 p.m. Tickets are $13 per person and are available at the door. Proceeds benefit the Gloucester Fraternity Club’s special needs children. The Beeman School Chorus will present “Beeman on Broadway,” songs and dances from some of Broadway’s most beloved shows, on Wednesday, April 15 and Thursday, April 16, 7 p.m., at Beeman School. Tickets are $5 for adults, $2 for students.